(NaturalNews) I don't know if you can feel it too, but there's a lot of cultural tension in the air these days. Many people believe things are on the verge of snapping, causing possible riots (the Zimmerman trial verdict), bank closures (bond market implosion) or another martial law scenario (like the Boston bombing). Whatever happens, we want you to be safe and self-reliant. Stocking up on storable organic foods is one of the best investments you can make in your health and survivability during any possible disruptions (including hurricanes and natural disasters). But most people have a huge gap in their food storage strategy: They're stocked up on bulk grains like corn and wheat, but they've left out stored fruit. That's a huge mistake because while grains provide bulk calories to keep you alive, fruit provides the natural nutritional compounds that keep you healthy and support your eyes, brain, liver, heart and virtually all biological functions*. The reason most storable food companies focus on soy, wheat and corn (and all their derivatives including hydrolyzed vegetable protein) is because these are "dead starches" that have a super long shelf life. And they're great for providing the bulk calories you need to say warm in the winter, for example, but they're dead, processed, nutrient-depleted foods that you can't live on forever. If you try to live on just soy, wheat and corn for very long, you'll suffer severe nutritional deficiencies and start to experience brain fog, immune suppression, eyesight problems and weakened organs throughout your body (including liver, kidneys and heart). This makes you susceptible to all the diseases that run rampant during hard times, including possible bioweapons or viral pandemics. 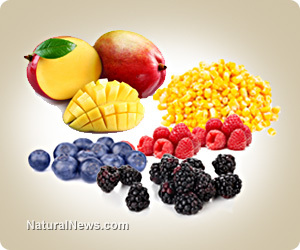 If you want to stay alive for very long, your diet needs nutrients that only come from fruit. But regular dried fruit doesn't store very well, and it doesn't taste very good either. The only way to store fruit so that it taste fantastic while retaining nearly all its nutrients (which are delicate molecules) is through freeze-drying. For the last several years, I've searched across the food industry to try to find freeze-dried, certified-organic, non-China, "clean" fruits available in a long-term storable format. They were nowhere to be found! Nobody offered them. Not a single company. We located all the best sources (while avoiding China), we achieved USDA organic certification for our food packing facility in Texas, we invested in the food packing and measuring equipment, then we began running production of these freeze-dried fruits (and corn) in #10 steel cans, sealed for long-term preparedness. As of today, Natural News Store is the only source in the world offering this extremely high-end storable food. It's all tested for heavy metals, certified organic, 100% non-GMO, 100% non-China, and it's packed in air-tight #10 cans that give you a minimum of 2 years of shelf life (but in reality much, much more if you keep it cool). Thanks to an abundant supply at this time of year, right now we've got our freeze-dried fruits on sale in a big way: Normally they're offered at a healthy discount off MSRP. But now we've taken an additional 15% off, giving you even deeper discounts when you buy four or more cans. Just pick up any four (or more) cans, and you can mix or match them any way you want. (They ship best in either 4 or 6 quantities, because those are the case sizes we have.) The shopping cart will automatically discount you another 15% off the existing sale price, saving you a bundle on the most nutritious freeze-dried certified organic fruits and superfruits you'll ever find. Bar none, this is the highest quality certified organic freeze-dried fruit available anywhere on the planet. You simply will not find a more nutritious form of storable fruits offered anywhere -- not at any price. Remember: These products are 100% fruit (or non-GMO corn, in the case of the corn). There are no fillers, no flow agents, no binders, etc.. In fact, these are not powders. They are whole fruit (in the case of blueberries) or fruit slices or chunks (mangos and others). So you can see with your own eyes that these are real fruits with no fillers, binders or excipients. Truly, there is no cleaner, more nutritious fruit available for long-term storage than what we've put together at the Natural News Store. If you're into being healthy and being prepared, this is the most superior product found anywhere on the planet. I also want to urge all Natural News readers to really question preparedness food providers. I've assessed the industry, and with a few exceptions, most of the preparedness food offered today is loaded with GMOs and MSG. Sure, they hide the MSG in ingredients like "yeast extract" or "autolyzed" or "hydrolyzed" proteins, but it's still MSG. And GMOs are rampant throughout storable foods. So much of it is based on soy, and almost 100% of that soy is GM soy. Most of the imitation meats in the food preparedness industry are actually made out of genetically modified soy. So when you're buying emergency preparedness foods, unless it's certified organic or certified non-GMO, it's usually GMO. This is something you really need to look out for, because I'm quite certain that in a time of crisis, you don't want to be discover all your stored food is laced with poison insecticides from GM corn. You might as well call it your "Monsanto stockpile" for that matter. And Monsanto isn't exactly the kind of company you want to rely on to keep you alive in an economic collapse, a civil war or a natural disaster. So if you do buy preparedness food items of any kind, make sure they're certified organic or certified non-GMO (Non-GMO Project Verified). I also want to warn you about cheap fruit powders sold on Amazon.com, eBay and other places. I've discovered they're almost all from China and they're usually cut with cheap fillers like soy lecithin or maltodextrin from GM corn. That's why the industry loves powders -- because they can cut the powders with filler and nobody knows the difference! In fact, here's a true story that will blow your mind. A few months ago, we ordered something like 1000kg of certified organic pomegranate powder. When the powder arrived, I opened it up to taste it and inspect the shipment like I do all our fruits. Immediately, I noticed the color: it was too pinkish and not dark red like I expected. So I began to suspect it had been cut. Then I tasted it, and sure enough it was super sweet. Well, I happen to know that 100% pure pomegranate powder is NOT that sweet. It's actually more bitter, so I knew something was wrong. I called the supplier and told them this didn't look like 100% pure pomegranate powder. And then they admitted to me that no, it was cut with tapioca starch as a "flow agent." When I asked what percent of the final product was actually pomegranate, they reply shocked me: "Thirty percent." So their product was 70% filler, and yet I know for a fact that many people are selling this right now online as "Pomegranate powder." And we don't play those games, so I sent the product back and that's why we don't sell pomegranate powder. You wouldn't believe the long list of products we reject... and then I see them selling at other places where consumers get routinely deceived. So much of the "powders" industry is a complete fraud, using cheap, low-grade powders from China that are laced with heavy metals and cut with genetically modified fillers. Toxic! So that's the real story of what I see happening in this industry. And Natural News Store strives merely to be a small, ultra-high-end, high-integrity supplier of the world's cleanest, most nutritious superfoods for consumers who know the difference between quality and crap.